English Breakfast Tea is simply my favourite blend of tea, I am happy to drink all day everyday. So what better than to share something you love with your Father as a gift on Fathers Day. This lovely blend of tea is packaged in a specially designed Fathers Day tin. Enjoy Fathers Day this year by sharing time with your Dad enjoying a cup of tea. the design on the tin, it is perfect and practical to keep your loose tea fresh from the moment you open the packet. It has a hinged lid with a tight seal. Clear instruction are printed on the tin for anyone not used to brewing loose tea. Sign up to updates from British Tea Lovers website and you will be emailed a 10% coupon code. If you also order the Father Day gift you can use the discount code DAD180 for an additional 10% off. buying that healthy Father Day gift, avoiding the obvious choices of alcohol, sweets or chocolates. the special Fathers Day gift of English Breakfast Tea can be purchased on line from British Tea Lovers for £9.99, but don't forget to also use your discount codes. The Strawberry Tea Diffuser is just £1.99. 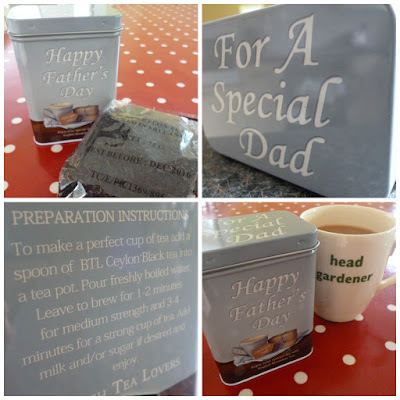 British tea Lovers are offering one of my blog readers the chance to win a Fathers Day Tin of English Breakfast Loose Tea. Closes 14 June 2015. Winner must complete the Rafflecopter details with their name and address so that the winners prize can arrive in time for Fathers Day. UK entrants only. For Terms and Conditions click the link on the Rafflecopter widget. Entry details will be checked and validated. Disclosure: I was sent a tin of tea and a tea strainer for the purposes of this review and giveaway.